When I found out I had a marshals place in the London marathon for 2018 I was really excited. The last time I ran London I had managed a sub 4 hour and maybe with a little more focused training I could perhaps manage a Good For Age this time. Cue my first adaption to plans! In November I commenced a 6 month course for work, which demanded all the time I had leaving very little time for running let alone good training. Oh well, I would use London as a kind of reward for all my hard study, something to focus on. Adaptation number 2 came in March when I was hit by a nasty virus which laid me out flat for 2 weeks. The following week I was managing to go to work, but having to retire to bed on my return. This was right when I should have been in the monster month for training. I considered deferring to next year but the focus of London was helping me get through all the hard days and nights of study. Goal adjusted I was now mentally ok with getting around in a decent time considering, maybe 4.15-4.20. Race week arrives and the weather forecast goes into overdrive. Now; I ran in 2007 which was the previous hottest on record so I knew how unpleasant this could be. At the marathon Expo, the talk from everyone was one of slowing your pace and adjusting your goals. In case I had not understood this the marathon sent out a text message to us all at 05.00 on race day reiterating the need to slow down and adopt their ‘drink, dowse, drain, drop’ policy. This message freaked me out; if they were this worried I would have to change my plans again. Just get round in one piece safely, I still have much more work to do for my course after all. So I got on the coach with a loose plan of 4.20- 4.30, but prepared to slow to whatever to complete safely, clearly I did not plan to be so slow they were burning the blue line on the road behind me, but there would be a happy medium somewhere. On arrival at the start the heat was already there. I sat with a few SJ’s under a tree having a breakfast picnic in the shade. As I looked around I could see far less fancy dress than previous years as people had heeded the warning not to run in costume if it was warm, but there were still a few nutters out there. Some were charging around doing complicated warm up routines and sweating before we had even got to our pens. I lined up with Claire Hobson and Sharon Burfield in pen 3 and we were released onto the course at 10.15. I settled into a comfortable pace locking myself into my own bubble ignoring all those around me so I would not get caught up in the madness of it all. I soon realised that Claire and Sharon were no longer with me, ahead or behind I had no idea. When I changed my plans away from a good time I had said I was going to enjoy this race, listen to the bands, see the sights (yes I did spot the Tower of London this time Sarah) and high five a few children. Generally soak up the atmosphere that London is famous for. Treat myself to a good day! The first 6 miles were good and I felt the heat was manageable for now. However when I got to mile 8 I notice my first sighting of someone collapsed at the side of the road looking pale and dehydrated. I am used to seeing this sort of thing at around mile 18 onwards, but not mile 8. Fortunately Paula and Fiona shouting to me distracted my mind away from thinking about this too much. Canary Warf and Docklands were hotter than Hell. The side of the road was now strewn with competitors in various state of collapse. It was noticeable the amount of extra St Johns and Police personnel on the route and they all looked very busy indeed. The nurse in me felt I should be helping, but everyone appeared to have at least 1 person attending to them. I actually found it quite distressing and a real challenge to my mental state, but I had to lock myself back into my bubble if I was going to get through this. Around mile 20 I was given a cup of water. I knew this needed to go in so I decided to walk while I drank it. This was good for getting the fluid in, but bad for the legs as they started to protest by begging to stop and rest. I could have walked from there but the thought of spending a moment more than I had to in this heat was unbearable. It was also at this point that I questioned myself on how I could have thought this was a treat! I had to run. Well, I say run, it was more of a fancy jog for a bit until my legs realised that they were not allowed a rest just yet. I was living each mile in turn. Looking at the crowds, chatting to my fellow runners, sharing my water with them, dowsing their necks, patting them on their shoulders and encouraging them on. I find helping others a great distraction to my own suffering so I used this to my advantage. I was looking forward to mile 23. I know this bit is shady and slightly downhill, just what I needed. When I got there I knew I was nearly home and the thought of my fellow SJ’s waiting for me at the finish line started to come into my mind. Come on Sacha, dig deep. The body count at the side of the road was increasing but the crowd were helping as well as the officials. No one just taking photos of these poor souls, like they did in the Commonwealth Games. The British really know how to rally the troops. As I ran along the Embankment, I felt a sense of pride in my country. Everyone there that day was there to support and protect us, whether they were volunteers, Police or spectators, and I am immensely grateful for that. Birdcage Walk came and I could hear Jim Laidlaw shouting out my name. I could have cried, but I still had a job to do. Turning onto the Mall is always a fabulous feeling, but today felt like a relief as well. I had managed to control the ‘inner chimp’ telling me to quit so many times, and overcome the blazing heat by controlling my pace. My goal was in sight. The marathon was done. My time was 4.26, so right on revised target. We are so lucky to have club members to greet us on the finish line. I was wrapped in a huddle of love and pride. Thank you to all you lovely people. After collecting my bag I sat on the side of the road letting the enormity of the day sink in. I thought of Boston a few years ago and how they must have felt. I feel very lucky to have competed in this race safely, surrounded by a palpable support system… #SpiritofLondon. 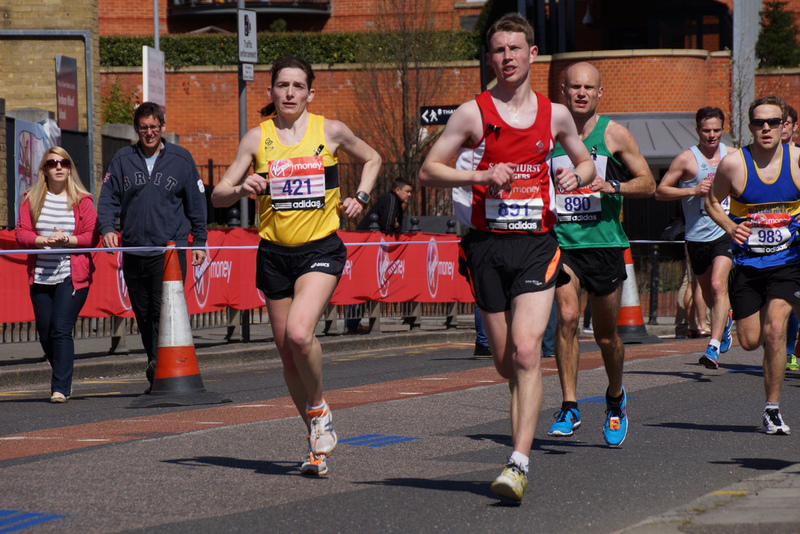 ← Tracy Robinson doubled down on this year’s London Marathon and despite the temperatures knocked 29 minutes off her PB!